using any Credit card or your Paypal account to pay! But be sure to Buy Only From <EUREKA PUBLISHING> to get the Newest editions! 11-Nov-2018 Wonderful THANKSGIVING Surprise! 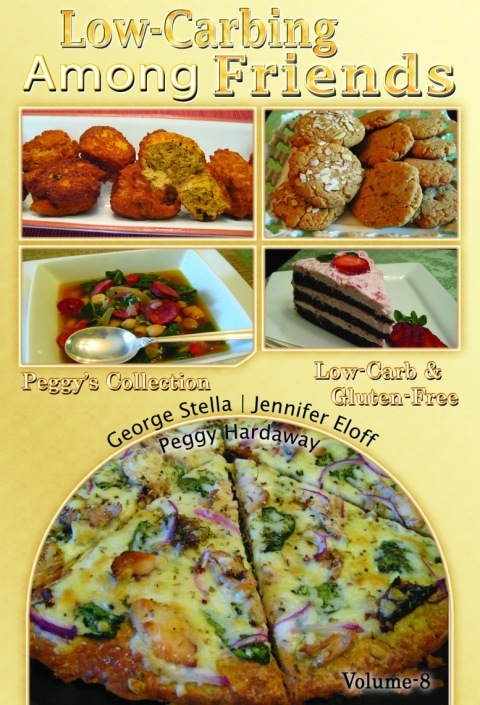 NEW cookbook! Our NEW much improved Vol-2 (2nd. Edition) has arrived! 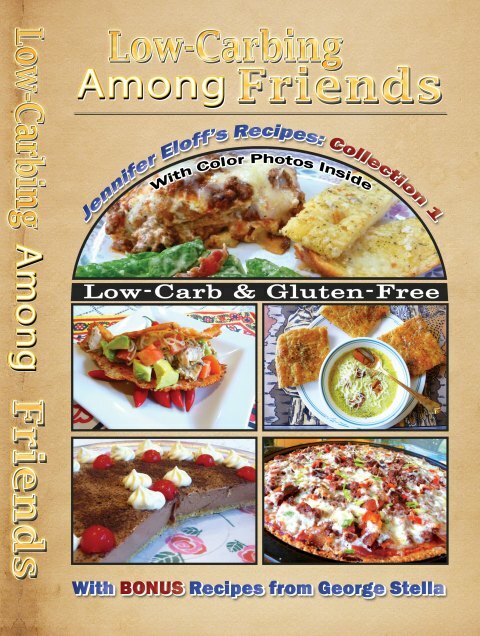 With MORE Color Photos than any of our cookbooks+Many new Recipes! 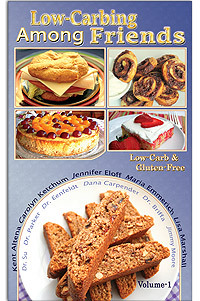 However you must order Coil-Bound cookbooks to get a new version! 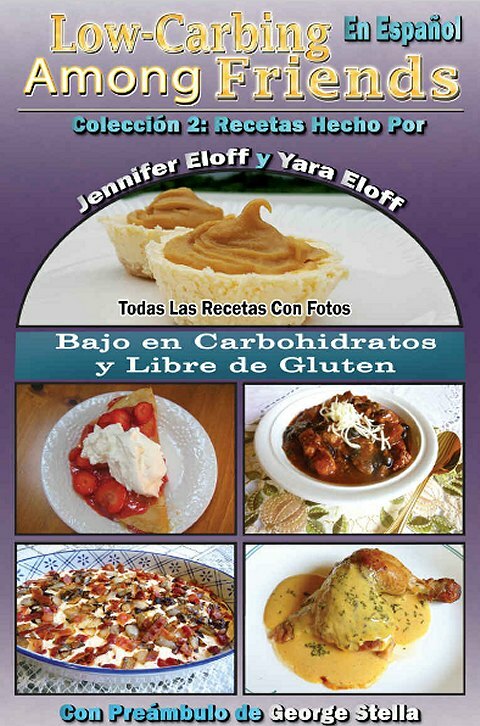 Jennifer Eloff's 2 NEW Books: Recipes Collection 1 & 2 have arrived! More than 100 Color Photos, organized by Category -in Kindle or Print! Our new revised much improved Volume-1 2nd ed has arrived! Our New Revised, much improved Volume-4 has just arrived! And the new IMPROVED Volume-3's BRAND NEW this year too! NOTE: Vol-5 (Below) has not been revised, yet. 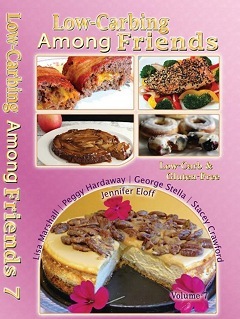 Low-Carbing Among Friends is a revolutionary cookbook series, in several rather unique and important ways: They're offered as perfect-bound (on Amazon - regular binding) and with Coil-binding (BUT that's a CUSTOM order direct from the printers) as many of you asked for COIL-Binding. It's much easier to use in the kitchen as it lays flat. 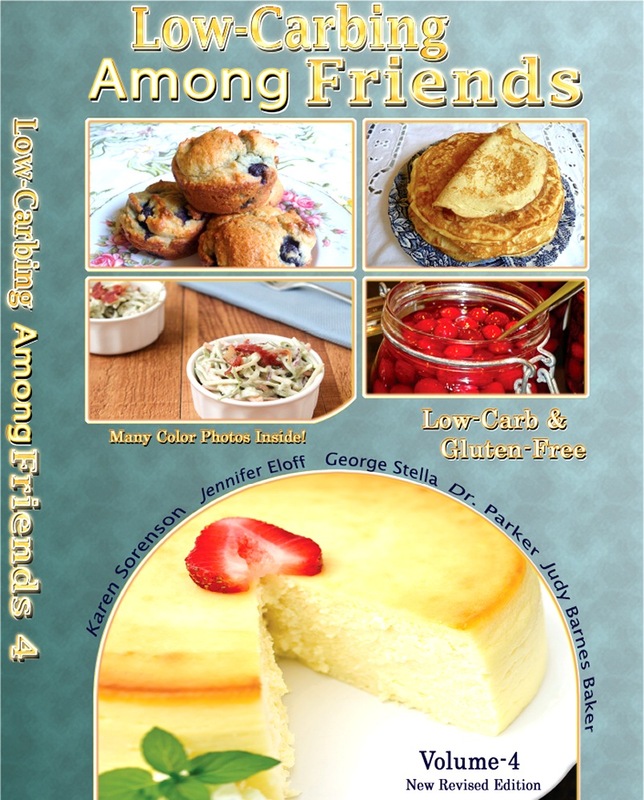 This NEW series of low-carb cookbooks, ensures that all recipes are strictly Low-Carb, and 100% gluten-free, Wheat-free and Sugar-Free. Note: Our authors have cross-checked their recipes with a wide variety of sweeteners, natural and not ... so please do feel free to use your own favorite sweeteners. 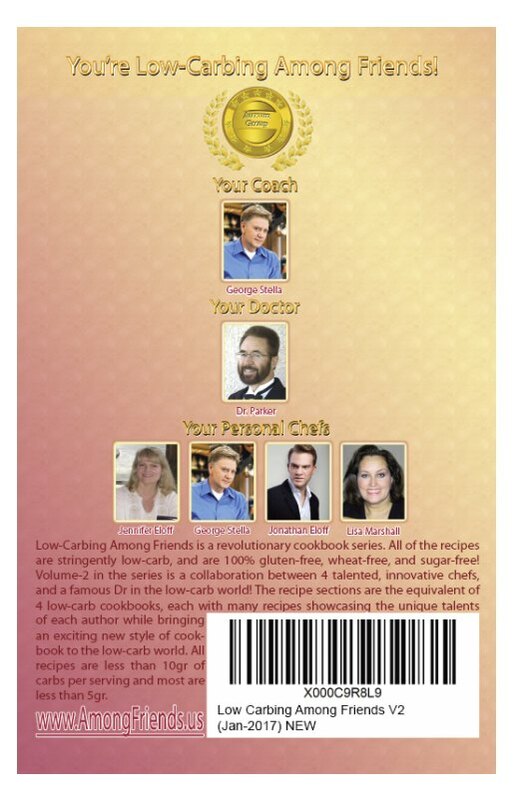 It's a collaboration between 11 talented, innovative Low-Carb authors - the 11th actually being "All of you, our friends" ... and all are welcome to join-in the fun, and 5 famous people in the low-carb world, four of whom are highly respected doctors and two of whom are very well-known low-carbing personalities - and all of them are our low-carb coaches, health advisors and cheer-leaders! 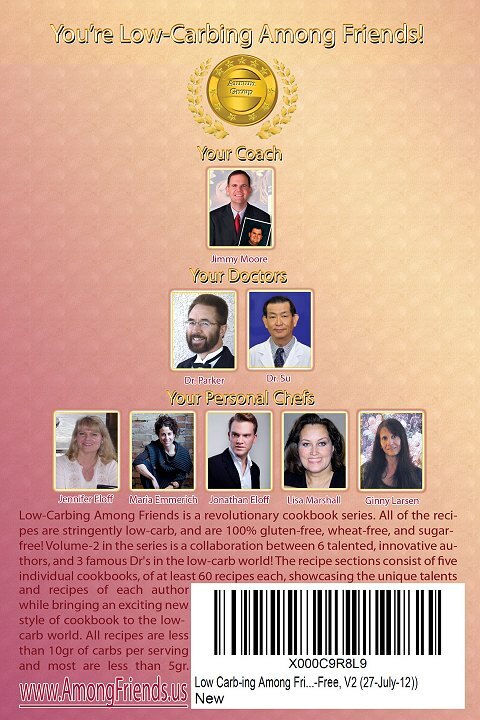 Also, each volume has a SUBSTANTIAL contribution from our Low-Carb Friends, and over time we will expand your role as guest-members of the team! 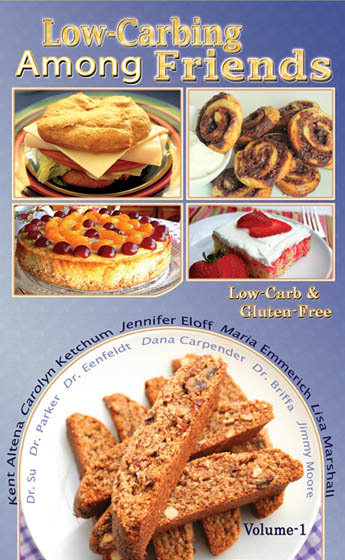 This entire series can ONLY be ordered online - which means that anyone who buys this Low-Carb collection, has access to our FaceBook page, This WEBSITE, all of the BLOGS and FB pages of the individual authors. Rather than place just a few color pics in the book itself, we decided to assemble: online photo-album-1, online photo-album-2, New revised Vol-3, New Vol-4, New Vol-5 and Photo album for the old Volume-3 here (and very easy to browse through) of these recipes, 450 ... and counting! 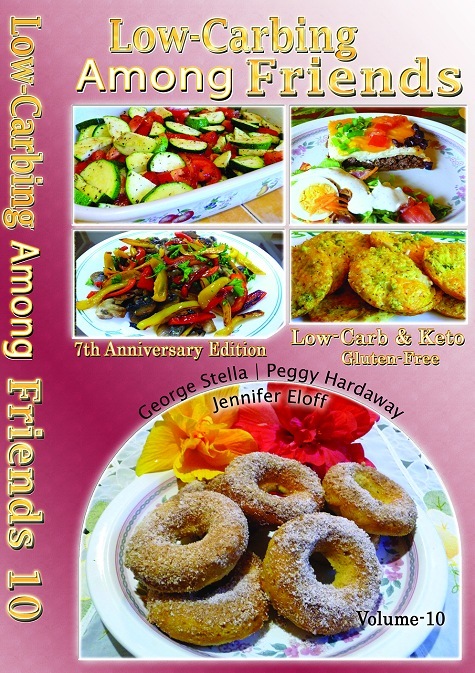 As none of AMAZON's top-20 Low-Carbing cookbooks has any Color Pictures in them, we remedied that nicely! Some said it could not be done ... well, this dedicated team, with your help and encouragement, proved them wrong! 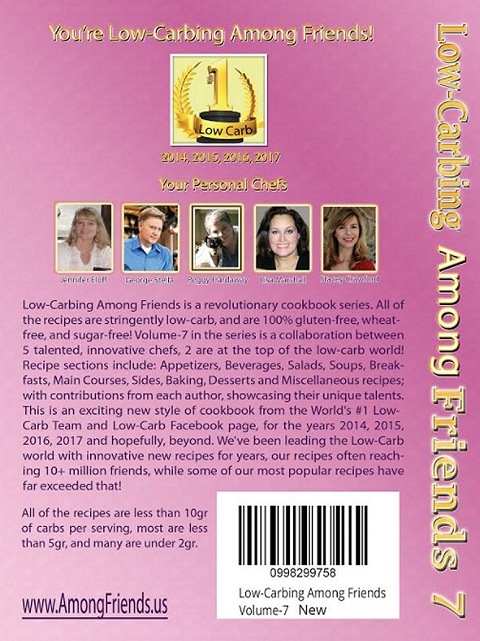 We all, together, created a collection of 1,400+ fabulous Low-Carb, Gluten-free, Sugar-free recipes, 5 books in just 3 years! 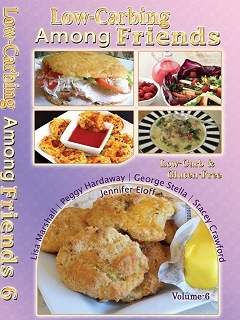 Buy "Low-Carbing Among Friends" direct from us & SAVE! Order now to ensure you get a substantial discount! NEWSFLASH: We're all excited about the good reception of this Series! 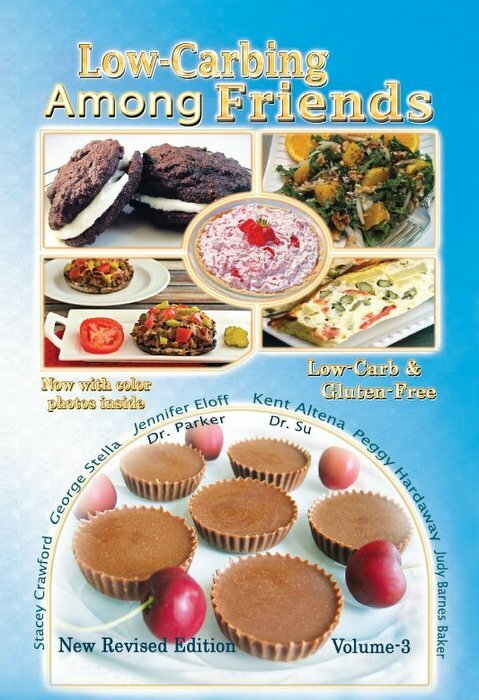 Vol-1 has in it 5 individual cookbooks and has 377 recipes (counting variations) while Vol-2 has 6 individual books and almost as many recipes, BUT it has a very UNIQUE section by JIMMY MOORE, which is packed-full of Low-Carb research information as an added BONUS! 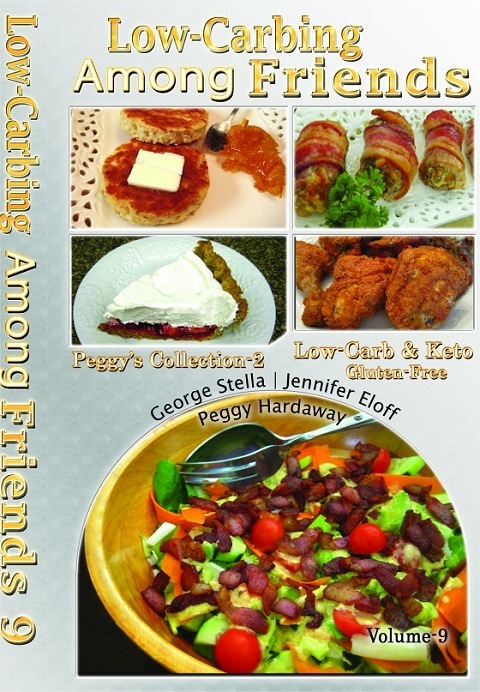 Vol-3 had 7 individual books and brought the total for this Trilogy to 1,111 recipes! 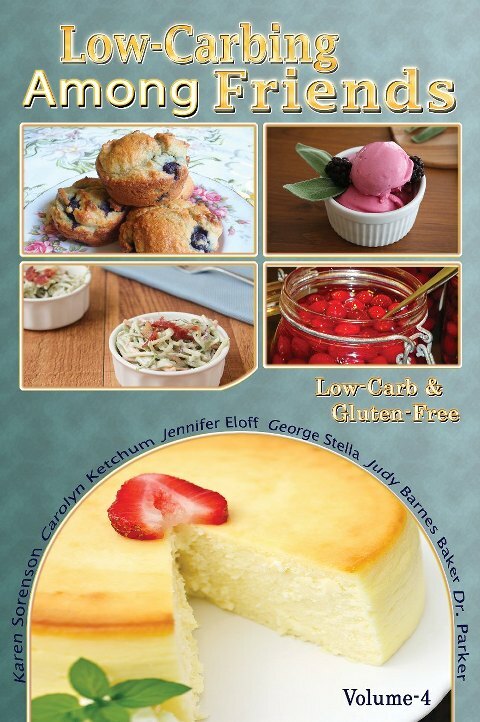 The new improved Vol-3 has the same format as Vol-4 & 5, recipes are organized by categories and we have around 30-40 color photos inside each book. 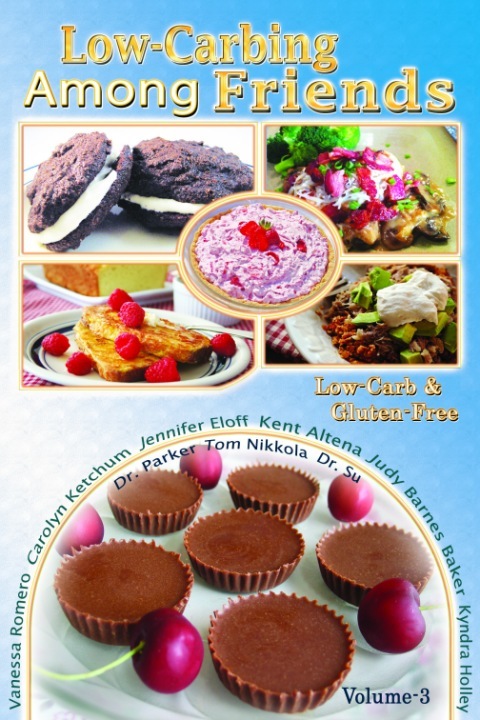 We showcase the unique talents and recipes of each author, bringing an exciting new cookbook series (never seen before) to the Low-carb world. 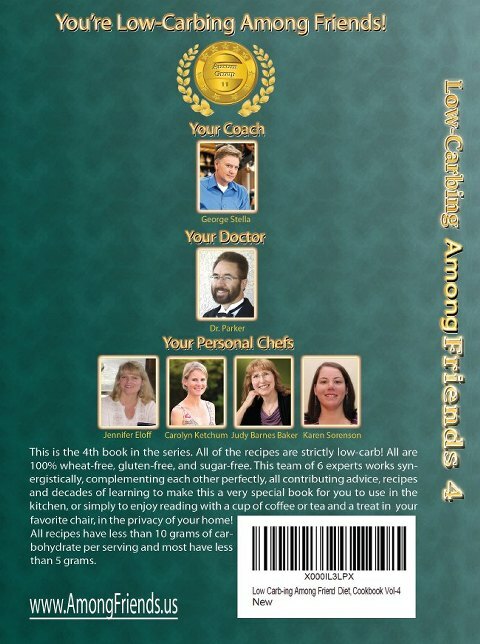 The team of 11 experts (and that includes many of you) work synergistically, complimenting each other perfectly, all contribute advice, recipes and decades of learning, to make Low-Carbing Among Friends a very special series of cookbooks to use in your kitchen or to enjoy reading, with a cup of coffee/tea and a treat in your favorite chair in the privacy of your home! 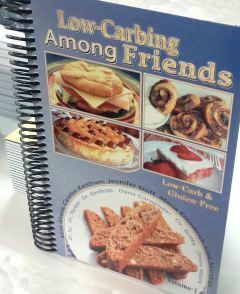 (Now also available also in COIL-BOUND) First & foremost, low-carbers will love this series of cookbooks! With many recipes from strict Induction to moderate low-carbing, All recipes are less than 10gr of carbs per serving and most are less than 5gr of carbs per serving and many are less than 3gr! 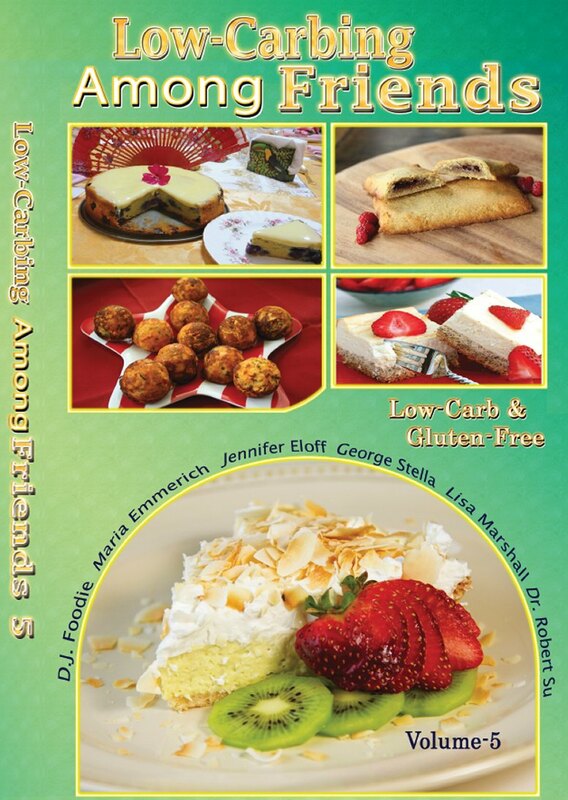 Secondly, low-carbers who are either intolerant of gluten or have Celiac disease, or who adhere to Paleo, will be thankful for this enormous recipe-resource and TASTY low-carb recipes that are also 100% wheat & gluten-free and also SUGAR-FREE! That's very important, as we've seen, lately, breakthrough research by Dr. Ludwig (and others) proving that SUGAR and HFCS are really very bad for us! These recipes are incredibly innovative, simply wonderful breakthroughs! 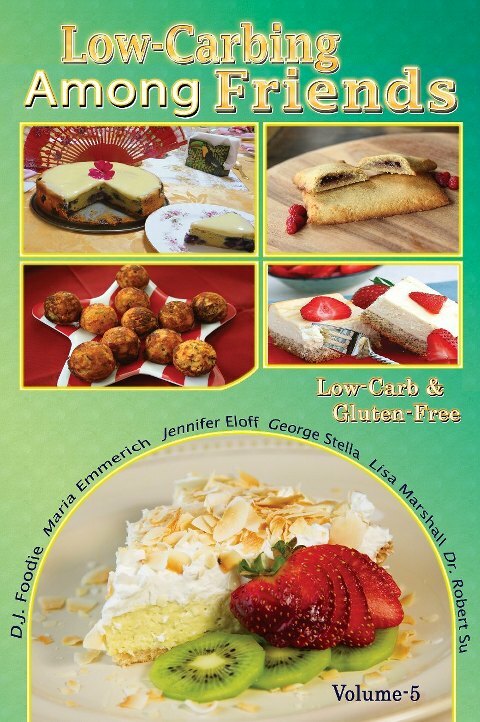 It is one thing to create low-carb and sugar-free recipes, most of us have a pretty good handle on that by now, but it is often quite another thing to also make those same recipes gluten-free, that's challenging! 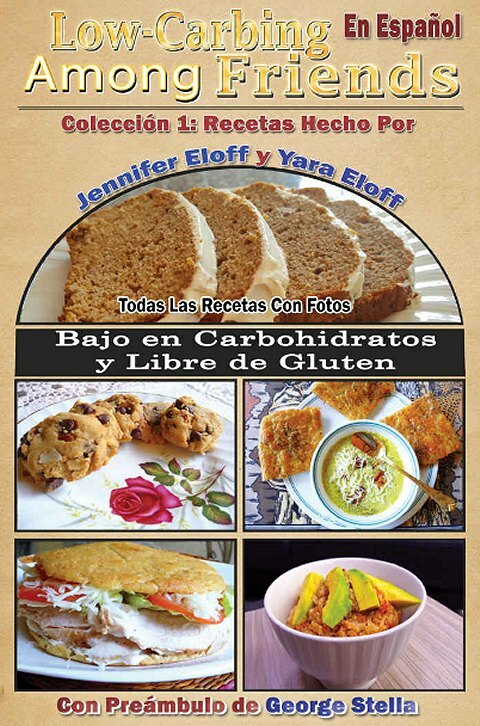 These NEW revolutionary, extraordinary cookbooks achieves that goal and have earned a place in your cookbook library. 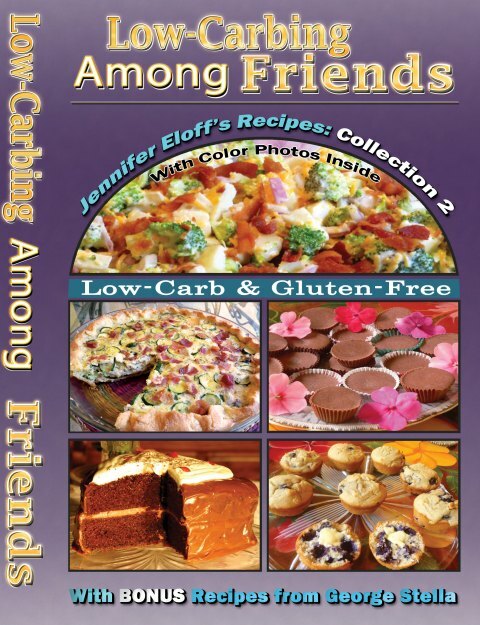 This photo, of Jennifer's cake in "Low-Carbing Among Friends, V1"
could have been used for the cover. It sure is pretty - but not appropriate. with this book. Did you notice there's a place reserved for you? 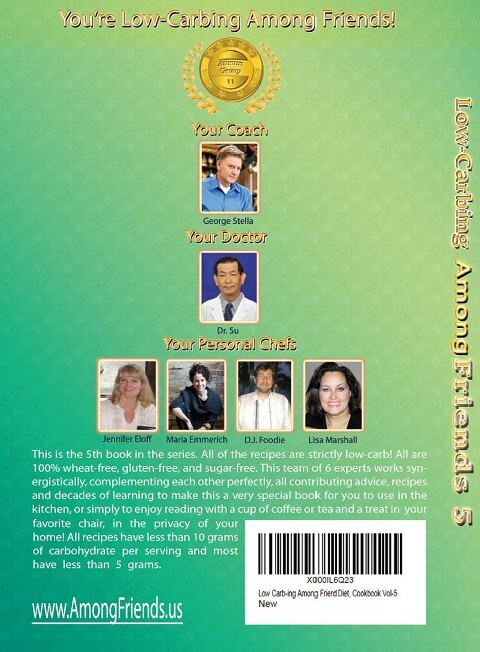 and 5 leading low-carb recipe creators, all innovators, pioneers. Please take one of Lisa's tasty sandwiches ... and enjoy it with your coffee! Then open the book and "open the conversation" ... you are "Among Friends". 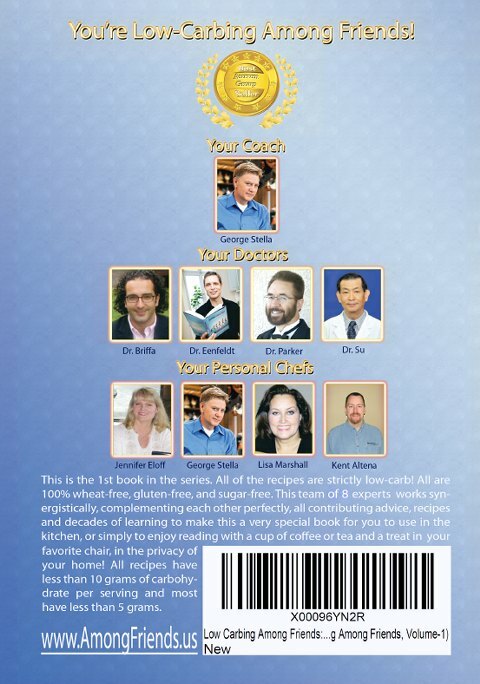 Around you is assembled the "Dream team", and we are visiting with you right in your own home! 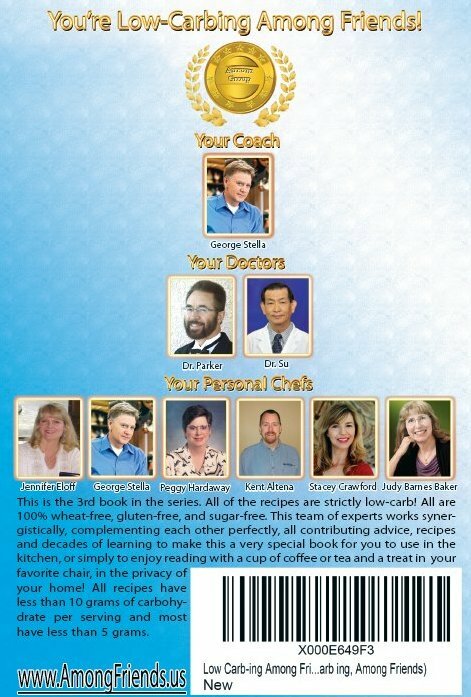 We are there, with you, to help you finally get a handle on many of the health and diet issues that constitute a very real modern plague, one just as deadly as any historical plagues ... and sitting around you are "detectives" that know what the causes are, what needs to be done, helping you triumph. The planned launch date for this series? 11-Nov-2011 (11/11/11) which only happens once every 100 years. For this team of 11 talented low-carbers, all their many helpers, as well as for the whole low-carbing world ... it's their date with destiny! It's also Remembrance Day, and besides the WWI vets, we want to remember Dr. Atkins, to honor his contributions to low-carbing. Where would many of us be today without his dedication and steadfast belief in this low-carb way of living? Join us for coffee or tea, chat to us about your concerns ... you are "Among Friends!" And by the way, for those intrigued by numbers, this year we're going to experience four unusual dates. 1/1/11, 1/11/11, 11/1/11, 11/11/11 and that's not all...Take the last two digits of the year in which you were born -now add the age you will be this year, and the result will be 111 for everyone...!! This year October will have 5 Sundays, 5 Mondays and 5 Saturdays. 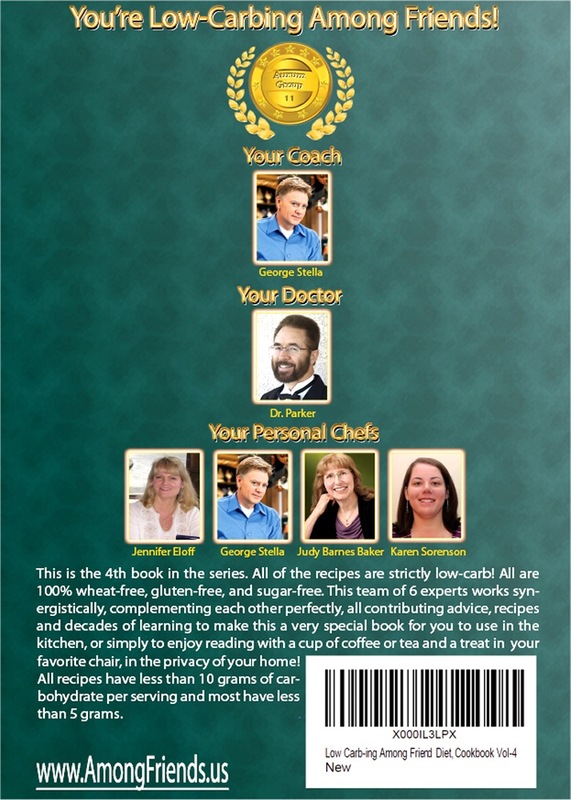 This happens only every 823 years... We made the announcement of this book on Monday 17th October, 2011, making this a "Rare cookbook" in so many ways, but most of all, because it's 100% Low-Carb, 100% wheat free, Gluten-free & Sugar-free. 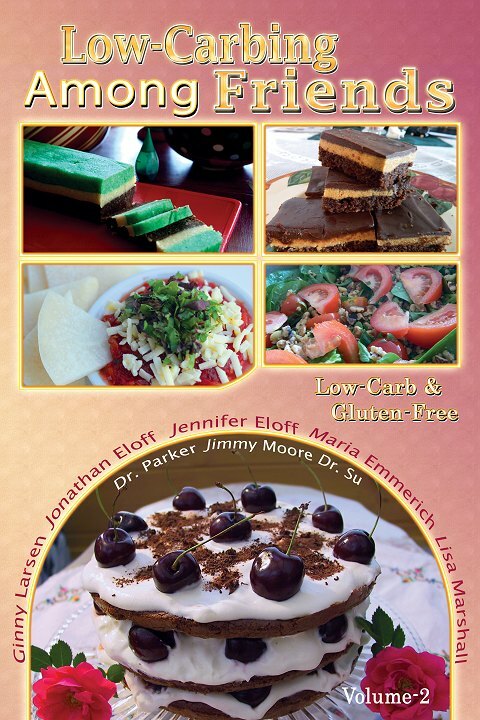 All recipes rich, tasty, filling, healthy, easy to prepare! #1 ... 1 of a kind! And Vol-2? It Launched 27th July 2012, the day the London Olympics opened. Why? Because we are TEAM Low-Carb in the "Diet Olympics" and because, as a member of the XV Winter Olympic organizing committee, I gave Jennifer the idea to form and model this team after the JAMAICAN BOBSLED team ... SERIOUS contenders (they were all top Sprinters) that nobody took seriously at first, but who injected a FUN element into a very serious organization ... and showed us that we really should've taken them seriously! 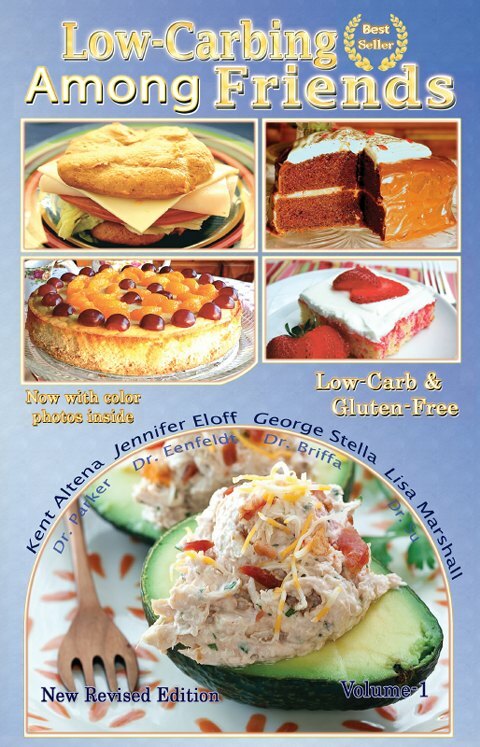 Our Team remembers Dr. Atkins who left us with such an amazing low-carb legacy! Where would we be without him? Now, study after study has enabled us, on his behalf, to all say to Dr Ornish and others ... "I told you so!" 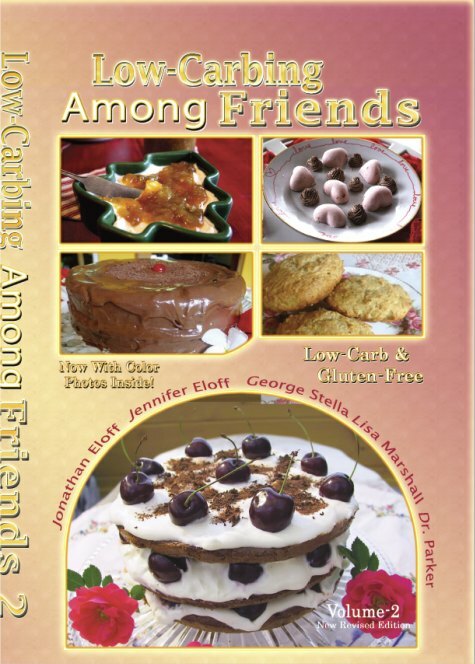 George Stella, Jennifer Eloff, Lisa Marshall, Peggy Hardaway, DJ Foodie, Stacey Crawford, Ginny Larsen, Kent Altena, Sandi DeFalco, Jonathan Eloff, Dr. Parker, Dr. Su, Dana Carpender, Jimmy Moore, Dr. Briffa, Dr. Eenfeldt and in Vol-3 & 4, Judy will join your winning team PLUS we will have a much expanded "Low-Carbing Friends" section, so come join us! 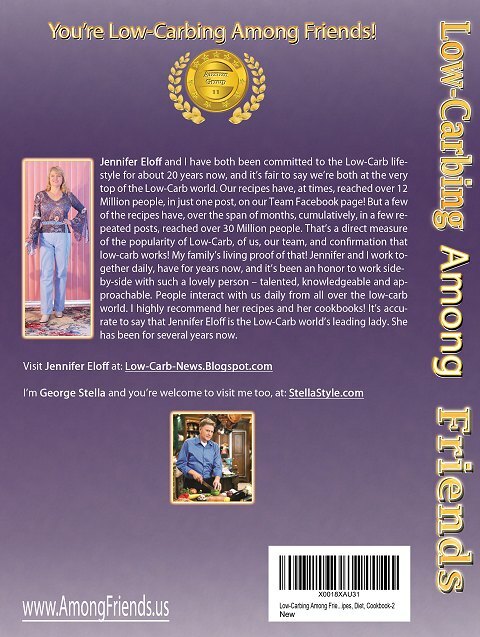 We want to acknowledge and warmly thank all our low-carbing friends and family members, for their support in helping this cookbook become a reality. Behind any award-winning team there always is a multitude of people who contributed in some significant way to that team being formed and going on to win Gold, and so we acknowledge and say thank you to them all for their contributions to Low-Carbing and to this book! Barbara (Barbo) Goldstein, Char Cunningham, Carolyn Follmer and Debra Matchell. Jennifer Eloff: With humble thankfulness to God and my dearest family; husband, Ian and sons, Daniel and Jonathan. Thank you, Ian, for your support in every way possible, for believing in us and helping me get this book done, again, even after you told me to retire, for all your FREE time and computer expertise. Thank you, Daniel, for taste testing dozens of my muffins (when Jon was in the city) until I got my Splendid Gluten-Free Bake Mix finalized. Thank you, Jonathan, for your hard work on the website, cookbook and covers. Thank you to my blog and forum friends as well for their much-appreciated support and encouragement. Lisa Marshall: I thank my Heavenly Father every day for the honor of caring for this amazing family of mine. I thank Him for my mama and grandma who taught me to cook � grandma for being the kind of cook who made everyday food taste incredible, and to my mom, who shared with me her spirit of adventure in creating new recipes. Special thanks to my husband, John, and my guys, Cecil, Andrew, Pearson and Christian for being taste testers through good and bad. You are my inspiration and the reason I don�t really mind doing all these dishes. Thanks also to Pearson Marshall, a senior in graphic design at John Brown, for helping Jonathan design a beautiful title, for the covers & websites! Kent: I would like to express my appreciation to my brother, Tim Altena, for proving weight loss success is possible. He set the bar further and further ahead and I simply had to follow his example. I would like to thank my relatives, as much of my inspiration came from their Sunday dinners and eating in their restaurant. I would also like to thank the viewers of my YouTube channel and members of Atkins Diet Bulletin board and other low-carb message boards, many of whom I consider friends in every sense of the word. 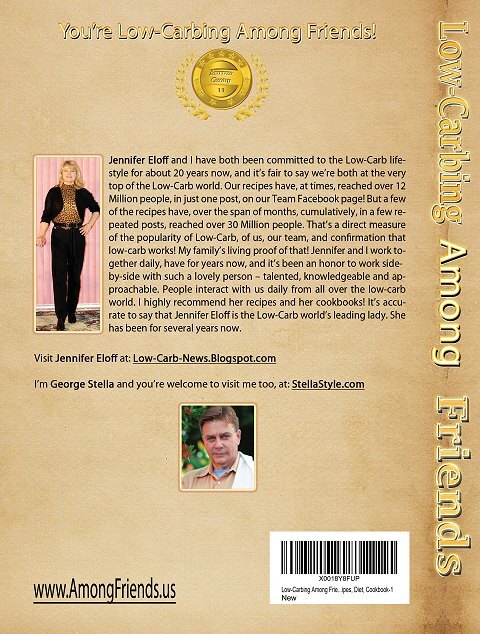 I would also like to thank Linda Genaw, Jennifer Eloff, Dana Carpender and Jimmy Akin, all taught me to look at food in a different way, and that this diet need not be boring, and also the many low-carb cooks who shared their work so freely with me. Finally and most of all, I would like to thank my family for putting up with hours of my filming cooking mistakes and successes and kitchen experiments, enabling me to help other people starting the diet, and for allowing me to pursue my dreams. Without their constant loving support, none of this, my weight loss, volunteer work, marathon running, videos and support of others, would have been possible.